Abu and Umm bought all kinds of toys for Ayman, changed his name into Ahmed, taught him how to memorise the Quran and enrolled him in a local school. For 18 months, they raised him like he was their own son. Ayman’s relatives had no idea the boy, who was four years old when he was kidnapped by IS, was living with a family in Mosul. “In fact, we didn’t even know he was still alive,” said Basma, Ayman’s grandmother, sitting in a concrete house in the village of Khanke, 20 miles southwest of Duhok in the Kurdish region of Iraq. But four months ago, local Arabs in a liberated part of Mosul told Iraqi forces that a couple was keeping a Yazidi child in their home. The Iraqi forces, accompanied by US soldiers, went to the house, and took him. A YouTube video by an NGO shows how Ayman clings to Umm, and holds hands with Abu while they are walking towards the vehicle of the Iraqi troops. On 28 January, Ayman was reunited with his grandmother in Iraqi Kurdistan, a safe haven for many displaced Yazidis. “I couldn’t believe he was still alive and well. It was a miracle,” Basma said, adding that 11 relatives, including Ayman’s real parents and brother, all from the Yazidi village of Hardan, are still missing. Basma was also abducted by IS, but was released when the group considered her too old to sell. While his grandmother was overwhelmed with happiness, Ayman had trouble adjusting. He missed his adoptive parents, whom he grew accustomed to. According to the Kurdistan Regional Government’s (KRG) Office of Kidnapped Affairs, Ayman is one of 6,470 Yazidis who were kidnapped by IS when the militant group attacked Sinjar in August 2014. While most of the men were killed and dumped in mass graves, Yazidi women and children were abducted, repeatedly raped or forced to fight for the militant group. Hussein Alqaidi, director of the Office of Kidnapped Affairs, told MEE at his office in Duhok, that around 3,010 Yazidis have managed to escape, including many women and children. Alqaidi said that the government hoped the operation to liberate Mosul from IS will lead to the rescue of many Yazidis, but until now, he finds the results quite disappointing. “We asked the Iraqi army to cut off the road to Syria in an early stage, because we knew many Yazidis were in Mosul. Unfortunately, that did not happen. Therefore, IS had plenty of time to transfer a lot of kidnapped Yazidis to other places,” Alqaidi said. Some of the kidnapped children were so young, that the memories of their real parents – who were enslaved or killed – had faded away. 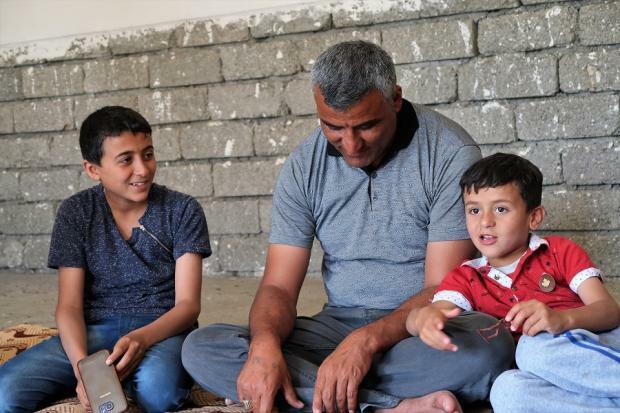 After living with an Iraqi couple for years, six-year-old Sipan Elias could hardly remember that his parents were Yazidis, let alone that his name was not “Dawud” as the Iraqi couple who bought him from IS called him. And if his “adoptive” parents did not cross the border to Turkey in April this year, no one would have ever found out that Sipan was still alive. “The couple that raised him wanted to take him to Turkey – I guess they were fleeing from the fighting. But at the border, security personnel found out that Sipan’s name was not in any document,” his grandfather Ali told MEE. Other children, however, were not as lucky as Sipan. They were used as house slaves. Akram Rasho, 10, was first put into an IS training camp. His kidneys were damaged when he was shot when his village was invaded by IS in 2014. But when IS decided he was useless because of his injuries and rebellious behaviour, they sold him to a Syrian family in Raqqa for 70,000 Iraqi dinars ($60). There, he was put to work in the house. “The family used to take me to the market and made me carry all the groceries. And inside the house, I had to do chores all day,” said Akram, who has suffered from psychological problems ever since he came back to what was left of his family, at the age of nine. His rescue story is a common one amongst Yazidis, who often have to pay local smugglers to have their family members returned. In this case, Akram’s uncle was contacted by a smuggler who knew where Akram was located. In order to smuggle him back to Iraqi Kurdistan, his uncle paid $10,000. It is hard to find out what exactly they experienced, as most children hardly speak about their often gruesome ordeals. Many were simply too young to understand what was going on. Khanza, a six-year-old girl with short dark hair, also talks little about her time with Umm Bakr, a “big and ugly woman” who bought her from IS, but when she does, she looks terrified. “Umm Bakr was very mean to me. She kept me in a room with nothing to play with. She also gave me bad food. I always had pain in my tummy, and I remember crying all the time because my family wasn’t there,” she stuttered, sitting in her cousin’s tent in Kabarto, an IDP camp for Yazidis. 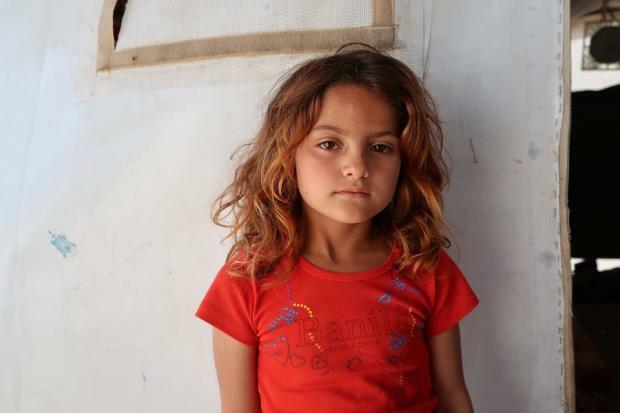 When IS invaded her village in Sinjar, Khanza was separated from her mother, but what happened to her remains unclear. According to her cousin Hanan, who has taken care of Khazna like a mother, the little girl was neglected, beaten and even burned with metal objects by Umm Bakr. “Khanza told us there were three men living in the house, all IS militants. By this we conclude Umm Bakr probably had close ties to IS,” Hanan said. “But we barely know what happened in that house. We are afraid to ask Khanza for details. When we do, she starts to cry immediately,” Hanan said. Three months ago, Khanza was rescued by a smuggler and brought back to the Kurdistan Region of Iraq. Recently, the little girl was taken to the doctor because she was vomiting all the time. The specialist concluded that she was malnourished due to poor nutrition. In addition, Khanza displays aggressive behaviour, does not trust anyone and suffers from nightmares. In her nightmares, Umm Bakr always plays the lead. To overcome her trauma, she now gets counselling from War Child employees, a charity based in London for children affected by war. “When my cousin just returned, she was fighting with everyone, and even chased the other children with knives. She must have seen this inside Umm Bakr’s house,” Hanan said. Not only did local families from Mosul buy Yazidi children, unmarried IS militants also bought entire Yazidi families and sometimes demanded that the children recognise them as their father. Tunisian IS sniper, Abu Dhar, bought 14-year-old Shalal, along with his mother, sister and younger brother from IS. 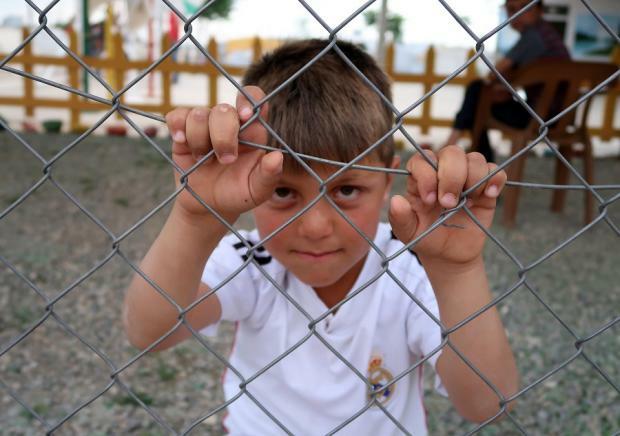 Shalal was forced to live away from his father, an Arabic teacher from Sinjar, for two years. He was rescued a few weeks ago along with his younger brother, while his mother and sister still remain in IS captivity. He told Middle East Eye they were all living in one house. Abu Dhar taught Shalal how to pray and how to shoot, before he left the house to carry out a suicide attack. One day an IS leader came to Shalal’s house. “Congratulations, your father is now in heaven,” he told Shalal. According to Shalal, they gave the family $500, because they considered them to be a “martyr family”. “[Abu Dhar] wanted me to treat him like a real father, but I just pretended to survive. He used to beat my mom really hard for no reason,” Shalal said. Forty days ago, Shalal and his brother escaped from IS captivity, and were reunited with their real father Khiri, who lost his entire family to IS. “I would never forget my father, not in a million years. I knew he was waiting for me back home,” Shalal smiled while looking at his dad.